This was a seemingly slow week in news, but we have some stuff to talk about- don't worry! Probably the biggest thing to happen around the parks is the ending of the Main Street Electrical Parade. The parade is ending its run at Walt Disney World on October 9, 2016, and heading over to Disneyland for a limited time. We knew the Paint the Night was ending on September 5, so now the Main Street Electrical Parade can fill Disneyland with its lights once more. The MSEP hasn't lit up the night in Disneyland since 1996! There has been no official word on what will replace the night parade in WDW once the Halloween and Christmas parades end their run, but rumors are out there. Frankly, I would love to see something new and different come to the Magic Kingdom, especially for the time ramping up to the 50th anniversary, which is only a mere 5 years away. Speaking of things ending, we also know that the Jungle Book: Alive With Magic show at Animal Kingdom will also end on September 5. While this show had mixed reviews also, it was definitely a great place holder since Rivers of Light had a hiccup this spring. If you look at it that way, then this was great! If you were expecting Rivers of Light but with Jungle Book, then, yes, you would have been sorely disappointed. There's been no official announcement as to what may happen in the fall with Animal Kingdom or Rivers of Light. Right now, the park hours seem to return to semi-normal close times of 7:30pm for the park once the Labor Day Weekend comes to a close. But, things may change, so stay tuned! Also, if you're heading to Magic Kingdom from now until November 18th, one of the mountains will be down for regular refurbishment. Big Thunder Mountain is getting the treatment for the next 3 months so you'll have to wait a while before riding the wildest ride in the wilderness! The Magic Kingdom welcomed the newest Disney princess this week, Princess Elena of Avalor. If you missed her Royal Welcome, here's the video! 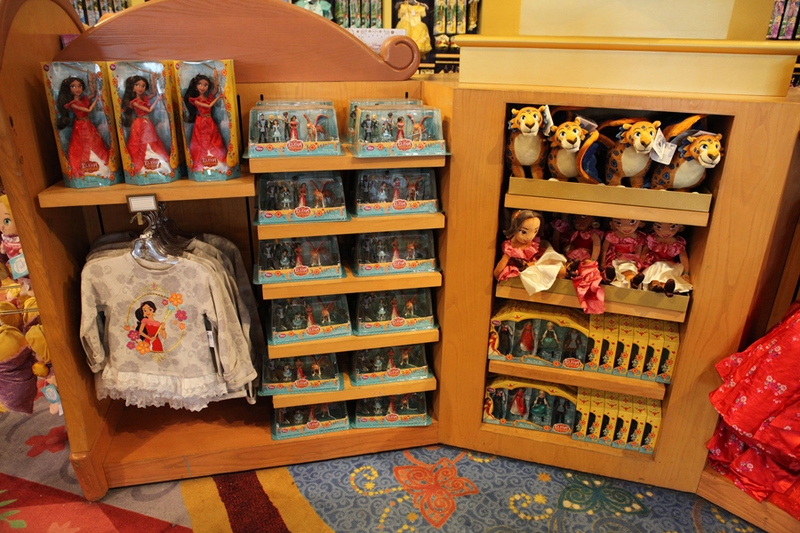 Now that she's an official Disney Princess, her merchandise has invaded the stores. Check our some of the stuff you can get, which ranges from dolls and clothing, to pins and accessories. If you're a runner, well the running season is about to commence at the Wallt Disney World resort. While marathon weekend in held in January and is the biggest event, I feel like things really start with the Wine and Dine Half Marathon Weekend because- best time of year, right? Here are the new medals for the Disney Wine & Dine Half Marathon Weekend, held November 3-November 6, 2016. There’s the inaugural Disney Wine & Dine 10K and Lumiere’s Two Course Challenge for those who participate in both the 10K and half marathon are new this year. This weekend also includes runDisney Kids Races and Mickey’s Holiday 5K. It looks as though Disneyland will be getting a similar structure to the parking garages that have helped Disney Springs welcome more guests as the Star Wars Land expansion ramps up. In 2018, Disneyland is set to open the new Eastern Gateway, a new arrival point for guests along with a parking structure complete with 6,800 spaces, elevated pedestrian walkway, and a new transportation facility. If you've been to Disney Springs, then you know that this addition in Disneyland will certain allow for more guests to come and enjoy the park with less sprawling parking lots. I enjoy the parking structures as it means that my car doesn't have to be out in the sun baking while I'm off having fun. The park news may be thin, but movies and t.v. have definitely taken over. This weekend Pete's Dragon opened, and has been met with some mixed reviews. The critics seem to love it but Disney fans have been divided. Guess we will have to see it for ourselves, but one thing is certain, this is not the same as the original, so that's a plus. We do have one sad note before the fun stuff- Kenny Baker, who brought the adorable R2D2 to life passed away at the age of 83. He will be missed but his work will be remembered for generations. We also have a new Rogue One trailer. I think that's all I need to say, right? Enjoy! The Star Wars adventures don't have to wait until December though. Star Wars Rebels is set to premiere on September 24! With the exciting finale from last season, the darker tone and ever present danger of the most feared Sith Lord and his Inquisitors, this new season has everyone eagerly awaiting it's premiere, as well as the entrance of Grand Admiral Thrawn. Movies have been getting new spots with the Olympics being on most everyone's television each night. Here's the one for Moana! There's also been talk of the upcoming Agents of S.H.I.E.L.D season. While it seems many people who didn't stick it out to the end of season 1 have not come back, I can let you know that you're definitely missing some good television (and this comes from someone who watches a lot of t.v). It helps that the show ties into the events that take place in the movies. This new season of AoS takes place after the events of Civil War, with the Sokovia Accords and those repercussions, as well as the events of last season with Hydra being "obliterated" and S.H.I.E.L.D. once again allowed to operate in the light, there's a lot of interesting stuff awaiting our team. We also get the introduction of Robbie Reyes, aka Ghost Rider, to make this season interesting. If you haven't watched, you should definitely catch up. After the second half of the first season, this show really took off and has become a great filler between the Marvel movies, and, sometimes, the events that happen in the show are more shocking and far reaching than the movies, dare I say. Speaking of Marvel movies- it's been confirmed! Everyone's favorite villain will return in Thor Ragnarok as played by the wonderful Tom Hiddleston. He very sneakily put this pic up on Instagram to let everyone know, he's back! I hope everyone has had a great week! Have a wonderful week, and I'll see you soon! Melyssa and the Mouse #1- Flying Fish Review!